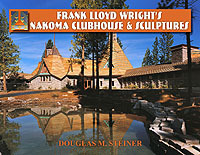 Frank Lloyd Wright�s Interiors (Hard Cover - DJ) Heinz, Thomas A. A photographic view of more than 1,000 interiors of homes, public buildings, and corporate buildings designed by Wright, matching interior design to architectural elements--comfort, convenience, and spaciousness. This incredible four-color book features his use of tradition, horizontal lines, natural elements, concrete, and three-dimensional space. Making a case for supporting the Frank Lloyd Wright Foundation. Frank Lloyd Wright... The Frank Lloyd Wright Archives... Vision and Mission... Building upon Strength... Taliesin and Taliesin West... Frank Lloyd Wright School of Architecture... Arts and Cultural Program... Launching a Capital/Endowment Campaign... Organizational History... 8.5 x 11 Gift from Kathryn Smith.